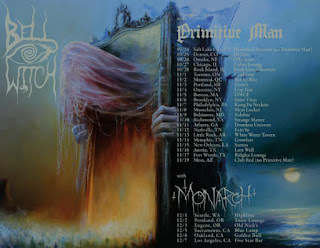 Seattle Doom Metal Duo Bell Witch Announces US Tour Dates With Monarch! Seattle doom metal duo BELL WITCH will join French doom metalists/labelmates Monarch! for a stretch of US live dates this December. The tour will commence on Dec. 1 and run through Dec. 7 with additional performances to be announced in the coming days. The trek follows BELL WITCH's previously announced North American tour with Denver doom troupe Primitive Man from Oct. 25 to Nov. 17. See all confirmed dates below. Additionally, BELL WITCH will bring their devastating odes to the stages of Roadburn Festival 2018. Set to take place in Tilburg, The Netherlands, the band will perform two sets, the first on April 21 at the 013 venue and April 22 at Het Patronaat. BELL WITCH will be recreating their soon-to-be-released, eighty-three-minute offering "Mirror Reaper" in its crushingly exquisite entirety. The feat requires the input of honorary member, vocalist Erik Moggridge (Aerial Ruin), who will be joining the band to complete the performance. Expect his fragile yet evocative vocal style to lend an even more ghastly and ethereal quality to BELL WITCH's already otherworldly sound. The anticipated "Mirror Reaper" is set for release worldwide via Profound Lore Records on Oct. 20. With their latest output BELL WITCH has created a truly enormous work - one continuous, eighty-three-minute piece unfolding as a single track. Engineered and mixed by veteran producer Billy Anderson (Swans, Sleep, Neurosis), the duo of Dylan Desmond (bass, vocals) and Jesse Shreibman (drums, vocals, organ) have pushed the band's sound further beyond their landmark 2015 LP "Four Phantoms." While retaining the colossal heaviness of their previous releases, "Mirror Reaper" sees the band explore the more meditative, melancholy, and introspective aspects to their sound through the introduction of long, lonely organ passages and the return of Moggridge, offering a prominent presence. In conjunction with the release, BELL WITCH has created a feature-length music video. The film is a video collage comprised of dozens of archival films. Each of these clips are woven together with the album to build a patient, heavy, and haunting narrative. The film aims to hold the viewer in the state of a lucid dream, feeling trapped as a specter drifting through places of darkness. "Mirror Reaper" will be a projection for the band's live performances, as well as a standalone cinematic experience. 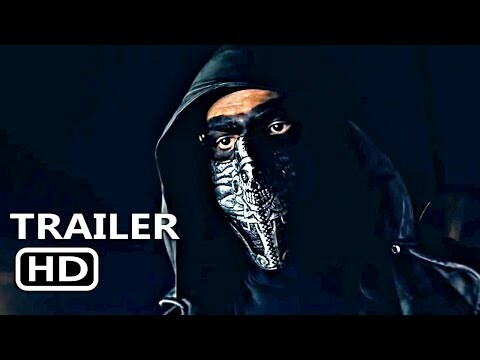 Director Taylor Bednarz said, "I was given the opportunity to work with Dylan and Jesse on their incredibly ambitious new project, Mirror Reaper. I had started making small fan music videos by chopping up old archival film originally as editing practice. I started to find that you could craft these visceral narratives by weaving these different films together with the context of the music. What developed were deep and mysterious stories that were framed in the tone and rhythm of the music. I noticed how much symbolism and atmosphere I could pack into these four-five minute songs that I knew it had very unique cinematic potential. When I met Dylan and Jesse, they were just finishing up the last of the album and had been kicking around the idea of a music video. I mentioned I was a filmmaker, showed them some of my work, and they extended the opportunity to make a film with them. After listening to the album and talking with the two, I started collecting dozens of old horror movies, anatomical films, historical documentaries. I am so honored to have gotten the opportunity to be a part of such an incredible project." BELL WITCH's Mirror Reaper will be available on 2xCD, 2xLP, and digital formats. Preorder your copy today at here..
"The title 'Mirror Reaper' is indicative of the Hermetic axiom 'As Above, So Below,' written with two sides to form one whole," notes the band of the themes surrounding the concept and lyrics of Mirror Reaper "The song is both its own and its reflection, as an opposite is whole only with its contrary. Our focus as a band has always been the perception of ghosts and the implied archetype of the dichotomy of life/death therein. 'Mirror Reaper' is a continuation of that concept. During the writing process we were devastated by the loss of our dear friend and former drummer, Adrian Guerra. In love and respect to his memory, we reserved an important yet brief section in the song for him that features unused vocal tracks from our last album. This specific movement serves as a conceptual turn in the piece, or point of reflection. We believe he would be proud of it as well. 'Mirror Reaper' was the first collaborative writing project with the new lineup, and Adrian's death during it brought extra emotional weight. We sought to match the complexity and weight of these events within the composition of the piece."